Readers will recall the letter in the New England Journal of Medicine (22 January 2015) on Hidden Formaldehyde in E-cigarette Aerosol – and its flawed highly misleading calculations of cancer risk that gained worldwide attention. See my various blogs on this scientific shambles). It now seems that Portland Univeristy is describing the team that brought us this fiasco as ‘fearless researchers‘, presumably because they have had the bull-neck to ignore the tsunami of informed criticism that has swept over them from scientists and knowledgeable users about the elementary errors in their methodology – to the point of mockery by analogy with burning toast. So let’s take a look at how they have defended themselves. On 16 April 2015, the NEJM published a critical letter and a reply by the authors. Usefully, the letter reveals the authors’ defence of their work and demonstrates that it is wholly inadequate. The case for retraction remains undiminished. Here are the 128 words of criticism of the study that the NEJM has so far seen fit to publish. Short, but to the point and correct. The data presented by Jensen et al. (Jan. 22 issue)1 in their recent letter to the Editor do not support their conclusion that e-cigarette use presents a likely risk of excessive exposure to formaldehyde. The 5-V puff topography used by Jensen et al. appears to have overheated the coil, resulting in excessive breakdown of propylene glycol to formaldehyde. This phenomenon is readily detected by the consumer by virtue of an exceedingly unpleasant burning taste, commonly referred to as a “dry puff.” It has been described in detail in the literature.2,3 The consumer can address this issue by discontinuing use of the unit or reducing puff duration while increasing the interval between puffs.3 Thus, taste prevents e-cigarette users from exposing themselves to excessive formaldehyde from overheating of the coil. Joel L. Nitzkin, M.D., M.P.H. Nitzkin et al. state that high levels of formaldehyde are found only under electronic nicotine-delivery system (ENDS) conditions that will not generally be selected by the users of these devices, making our results of limited importance. However, for the broad range of products and practices used in “vaping,” there is a lack of objective data with which to judge whether these devices are being used as safely as possible. In addition, it is well known that although inhaling cigar smoke is unpleasant for some, many cigar smokers do inhale. Furthermore, chemical principles indicate that formaldehyde production on the heating of ENDS fluids is not a “yes or no” proposition. Rather, formation of formaldehyde, formaldehyde hemiacetals, and other possible toxicants will be dictated by a continuum of conditions. Thus, it seems plausible that toxicant formation can occur without a particularly bad taste, especially given the known taste-masking effects of high levels of flavor chemicals in many vaping liquids.4 Beyond this, we are finding that even some units without any user controls can produce considerable levels of formaldehyde hemiacetals. There is a lack of objective data with which to judge whether these devices are being used as safely as possible. This reporting of this study makes the affirmative assumption that the products are being used in the unsafe conditions they measured, but they are not. The concept of “dry puff” is well understood by vapers and described in the literature – but the authors proceeded as if they were confident that their laboratory settings were realistic (and not creating dry puff conditions). The responsibility rests with them to ensure their experiment simulates realistic vaping conditions – which they could have done easily and could still do today if they wished to validate their own results: just ask a human vaper to simulate the machine conditions they used in their study. Replication is supposed to be a virtue in science, and it is notable that the ‘Fearless Researchers’ at Portland have not so far found the courage to rerun their study to check if they were running in dry puff conditions. I’m sure sure someone will soon. It is well known that although inhaling cigar smoke is unpleasant for some, many cigar smokers do inhale. There is no evidence or experience suggesting that vapers continue vaping through dry puff conditions, which create a painful burning sensation – the analogy is arbitrary and misleading and not a reliable basis for claiming that vapers will inhale substantial quantities of formaldehyde or other thermal degradation products. Vapers, in fact, control their use of the device to avoid this. Just because some things happen with cigars doesn’t mean they can assume they are happening with e-cigarettes, and it doesn’t absolve the of the responsibility to check for this in their methodology. Formation of formaldehyde, formaldehyde hemiacetals, and other possible toxicants will be dictated by a continuum of conditions. Pedantically, there will be a continuum – but so what? The researchers own experiment makes two readings only, and tells us nothing of the shape of the continuous curve between these points, nor does it tell us how quickly aversive dry puff conditions develop with rising formaldehyde. At the lower voltage, no formaldehyde hemiacetals were detected. Thermal degradation reactions require a threshold of energy input to break otherwise stable chemical bonds, and, therefore, the formation of these compounds has non-linear characteristics with respect to temperature. It seems plausible that toxicant formation can occur without a particularly bad taste, especially given the known taste-masking effects of high levels of flavor chemicals in many vaping liquids. That this “seems plausible” is not a reliable basis for Jensen et al‘s cancer risk calculation, especially as dry puff conditions are a well understood and recognised phenomenon. Dry puff conditions do not just produce a bad taste, they create a painful burning sensation. Jensen et al cannot justify their research and unqualified conclusions on this basis – including citing another speculative paper about flavours in combustible tobacco products that has no relevance here. They were responsible for ensuring their calculation of cancer risk was based on realistic conditions for humans and could have checked this easily by asking a vaper to simulate their puffing regime with the chosen settings. Beyond this, we are finding that even some units without any user controls can produce considerable levels of formaldehyde hemiacetals. This suggests that the authors still do not recognise the nature of their error – that is to neglect the human control feedback that prevents human exposure to high-temperature operating conditions through a behavioural response to the harsh taste and burning sensation created by vaping at high temperatures. Even where there are no user settings on the device, the users exercise control over operating conditions by moderating their rate and depth of puffing, or as necessary, adding liquid in response to the harsh taste. Before the authors try to publish any more on this, they really should talk to people who use these products and try to understand the behaviour they are investigating. 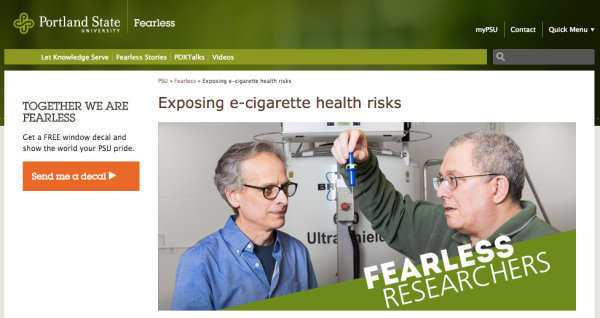 Even the caption on their ‘fearless researchers’ page tells a story: “Exposing E-cigarette Health Risks“. Really? For something to be a health risk, you have to be confident that a human will be exposed to it. For you to expose it, it has to be a real thing and have been concealed. In fact, their measurements expose nothing at all and certainly not any health risks. They’ve even set up twitter hashtags to promote this guff: #FearlessPSU and #PortlandState – thanks for sharing! Haha this whole article is so bias it hurts. Dont bother to include any resources, it might hurt your brain. Well, I guess we both know _you’ve_ never had a dry hit, now have you? 0/10. Trolling is a art. The NEJM study was flawed but their mistakes do not change the fact that a lot of ordinary, unmodified gear can produce enough power to combust the fluid and produce toxic emissions. The good news is that most of that gear can be set to low power levels that are mostly harmless. Sadly, because of the constant propaganda by big vaping, big government, and big tobacco we have no way of knowing at what power any of our gear starts to burn the liquid. True, but does it really matter when your tastebuds are excellent formaldehyde detectors? I don’t know anyone who willingly inhales burnt vapour, let alone anyone who habitually dry hits on purpose. Wonder if you get commission if you do research that attracts funding to an org? You can add a few more names to “Fearless” ……….. “Ignorant”, “Stupid”, “Cancer Apologists” ………………. by promoting this utter nonsense they may actually have stopped people vaping and prevented a few smokers from quitting in the easiest way possible. They may have been complicit in more people dying before their time. Do they really want that on their conscience? Misguided idiots who cant see passed their own self important noses. They really do not understand nonliniaer .